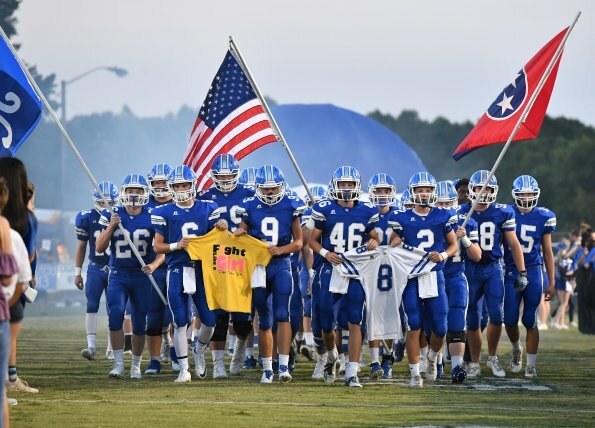 WHITE HOUSE – Senior Seth Bumbalough took his team on his back just seconds into the game on Friday night and White House rolled to a dominating 53-16 victory over Glencliff. The Colts won the toss and deferred, and Bumbalough took the opening kickoff 85 yards to pay dirt, with Will Frazer adding the two-point conversion for an 8-0 lead just 14 seconds into the game. Bumbalough wasn’t finished though, as White House used a short kick moments later and Bumbalough recovered Jacob Harper’s kickoff to give the ball back to White House. By the end of the first quarter, it was 29-0, and by halftime the Devils held a 50-point lead. Harper added a 28-yard field goal before two late Glencliff touchdowns. White House (2-0) blocked a punt, recovered two of its own kickoffs and only punted one time, late in the game. 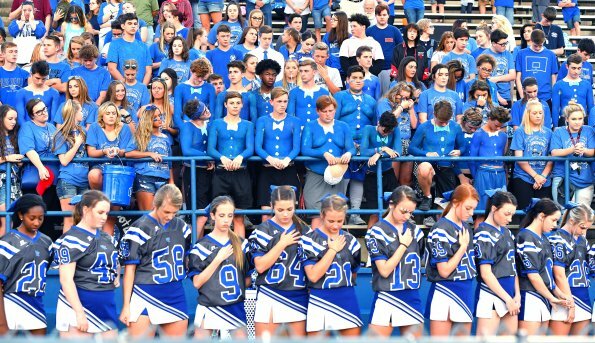 It was the most points scored by White House since the 2014 season in Week 9 when the Devils beat Cheatham County, 56-7. “Our kids bought into the game plan tonight and game out ready to execute,” assistant coach Ryan Hamilton said. 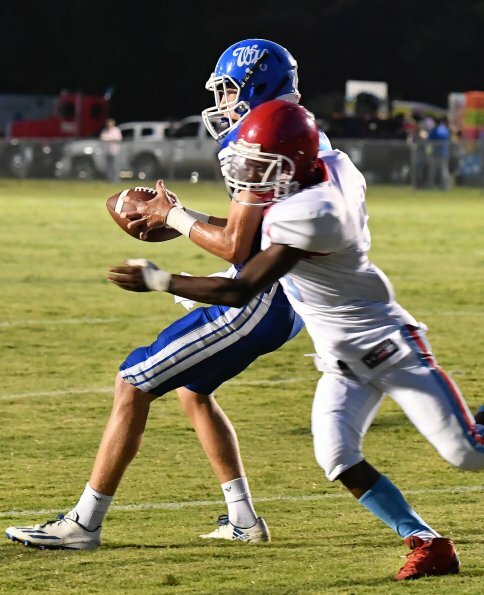 “We knew that Glencliff had some athletes, so we were creative in the kicking game and Seth’s early return set the tone and then we mixed it up on kickoffs and kept them off balance. Our plan in the kicking game was to keep it away from them deep early. 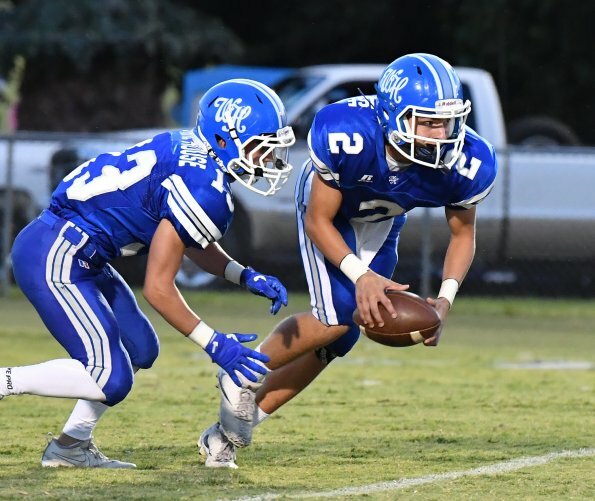 The Blue Devils had just 282 yards of total offense, but played the better part of the night with a short field. Meanwhile, Glencliff finished with 157 yards, but gained the majority on two long pass plays in the fourth quarter of 31 and 43 yards for touchdowns from D’Andre Humphrey to Rishad Petrus. Andrew Nixon was efficient for the second week in a row, again throwing two touchdowns to one interception. He completed 5-of-8 passes for 63 yards – including a pair of touchdown strikes to Brett Drake. The senior split-end caught one on fourth-and-goal at the 17, and the other a 20-yard strike in the right corner of the end zone. Ten different backs touched the football, with Will Frazer leading the way with 59 yards on nine carries, plus touchdown runs from Keyvan Dickerson, Wil Blackburn, Cameron Casanova and Nixon. Logan Neufeld had two catches for 15 yards and a 22-yard run and Bumbalough added 33 yards on the ground to his stellar night. 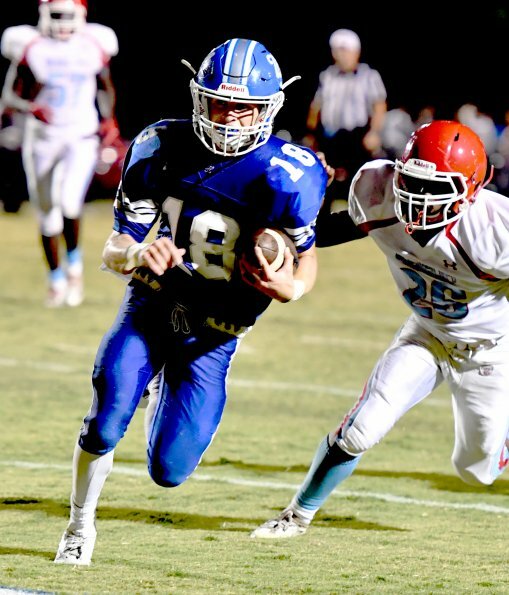 The Blue Devils rushed 33 times for 219 yards. The most exciting run of the night came on an end around when Casanova sprinted from right to left for a 24-yard touchdown. Casanova also recovered a fumble. Glencliff has lost 18-straight games in the regular season and been outscored 108-16 in two weeks of 2017. White House, on the other hand, heads into the bye week 2-0 and an 88-16 point margin. The first road game is Week 4 against Hunters Lane. The White House defense has allowed just 227 yards of offense in two games and recorded eight sacks. Joey Cartwright and Tyler McMurtry split a couple of sacks for the second week in a row and Cartwright now leads the team with a whole or partial sack five different times this season. White House head coach Jeff Porter missed the game due to an illness in the family, but will return to lead the team as normal. Friday was the first meeting between the Colts and the Blue Devils.